Cooking for yourself saves cash, makes housemates happy and keeps you healthy – it’s all good! Before you arrive in your new digs, it’s a good idea to have a conversation with your housemates about how the grocery shopping and cooking is going to work. Are you going to shop together as a household or each buy your own food? Are you going to take turns cooking or just decide on the day and cook for whoever is at home? Food that goes missing from the fridge and people who owe money for shopping are issues that can quickly escalate into major disputes. Not everyone has the same ideas about communal shopping and cooking and, while most people are happy to pull their weight and contribute time, money and a bit of effort into stocking up the cupboards, preparing meals and clearing up afterwards, it’s not a given. If everyone agrees to a few basic house rules before you move in, there’s less chance of people falling out when someone drinks the soya milk by mistake, or if after a night in the pub someone helps themselves to the ingredients you’ve bought for a special dinner. If you’re going to buy groceries as a household, online shopping is a good solution, as it means that you don’t all have to physically trudge to the supermarket on a weekly basis – you can shop from home and take your time to work out the best deals and the most convenient delivery time. Order all your basics together so the bill can be split evenly. The same applies when it comes to cooking: choose some easy midweek meals and share the cooking. But when it comes to ordering specialist ingredients, or an item that only one person wants, it’s best to do this separately. Looking for some al fresco recipes to make your vegan barbecues and picnics more exciting this summer? 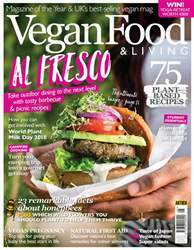 Look no further than the August issue of Vegan Food & Living as we have ideas for burgers salads, quiche and beyond. Also this issue we share the best dishes to cook up on a camp fire, reveal how you can get involved in World Plant Milk Day 2018, share 23 remarkable facts about honeybees and why you shouldn't eat honey, plus how you can put together nature's best first aid kit. What can HERBS do for us?